BIke Catcher being a new product is starting get a little buzz around areas of the bike industry. We have already announced our link via API to Catalyst systems. Catalyst have now announced to all of their customers and also in their latest Newsletter about Bike Catcher. If you want to see what Catalyst have written about us, please read on. At Catalyst we are always thinking of ways that we can help you save time and make money using our Catalyst Software. One very effective way of doing this is web advertising. At the moment we have many different websites that you can choose to advertise on from within the Vehicle Sales module and we are always working to expand the selection available to you. Our latest addition is Bikecatcher.co.uk. trade and public can sign up online at www.bikecatcher.co.uk. Bike Catcher is proud to have teamed up with Catalyst to provide a seamless link from its internal software up to the Bike Catcher portal allowing Catalyst customers to join and list bikes without any major additional work required.” – Rob Brown, Director at South Coast Web Design. 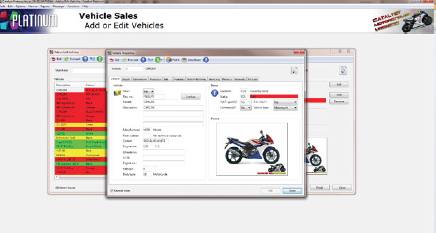 ‘Vehicle’, ‘Details’ and ‘Sales’ tabs when you ‘add/edit a vehicle’. If you would like to advertise your vehicle stock on Bike Catcher contact them on 0800 9496036 to set up your account. Once you have a Bike Catcher account in order to advertise your bike stock on Bike Catcher from Catalyst you will need to download and complete a ‘Data Permission Form’, and return it to us. This gives us the permission to allow Bike Catcher to access your vehicle data. Once you have done this a member of our Support Team will contact you and arrange for the feed to be set up. Finally, after the data feed has been configured the ‘Bike Catcher’ tick box on the ‘Web Publishing’ tab in the ‘Vehicle Properties’ will become available to select vehicles for upload.